The weather isn’t the only thing that’s frightful during these snowy, wintry nights. 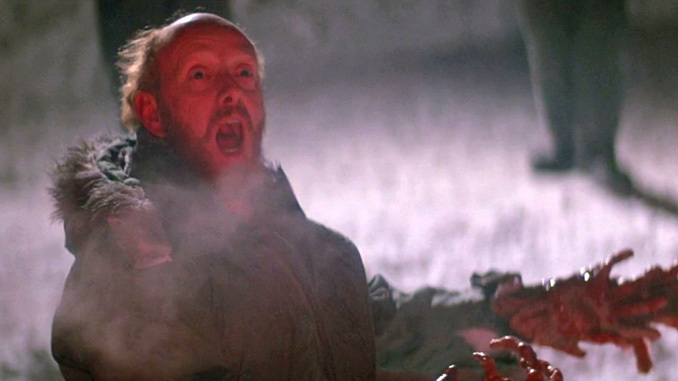 Some of the best horror movies take place in the frigid cold during a snowstorm. The cold atmosphere can help to create a closed in feeling, even though there are often open spaces for as far as the eye can see. Despite that open space there is something about winter that is perfect for a horror movie. Maybe it’s the isolation, or how vulnerable people are to the cold. Maybe it’s the hopelessness that comes when you have sunless days and everything is painted white and gray. No matter what the reason, winter is a perfect time to stay inside near a delightfully warm fire. 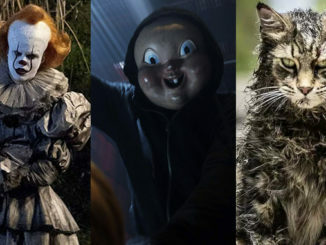 Hopefully, after one of these movies leaves your blood run cold, that fire can leave a warm and toasty feeling. 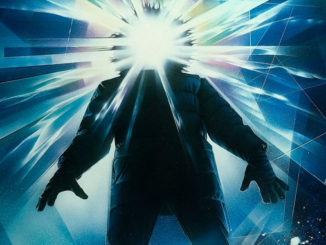 John Carpenter’s The Thing may not be the first or the last of The Thing movies, but damn if it’s not the best. It stands as one of Carpenter’s or star Kurt Russell’s best movies, and that’s an impressive position. A group of researchers in Antarctica are terrorized by paranoia and an alien creature that can take over any living organism. The effects are perfectly ’80s, the acting is subtle, and the horror is real. A better movie to watch during a snowstorm you will not find. Being stuck inside during the long winter can make a person stir crazy, so why not get outside and do a little skiing? Well, writer/director Adam Green has a terrifyingly logical reason why with 2010’s Frozen. Three skiers are stranded over in a chairlift in the bitter cold while the resort is closed for the week. There is a claustrophobic feeling while the three have to make difficult decisions in order to survive in the vast frigid air. Set in a little town during a blizzard, a radio host isolated in the studio broadcasts the events of the virus that is infecting the entire town. 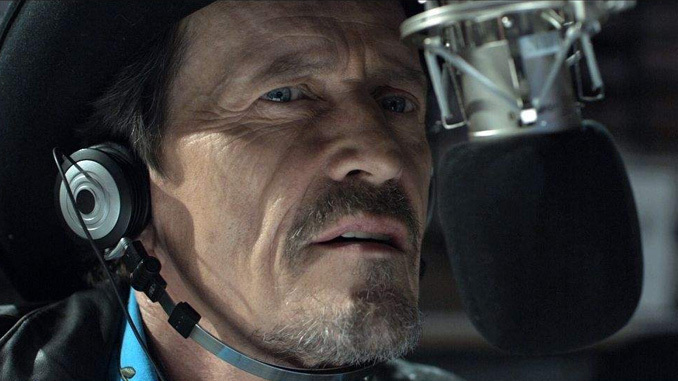 Pontypool is not your average “zombie” movie. Unlike many it doesn’t rely on a lot of gore or too much humor. In other words it’s smarter than most. It is reminiscent of Dawn of the Dead where we follow a small group in an isolated area, but on a much smaller scale. When you’re trapped inside during the winter, Pontypool is an excellent companion. 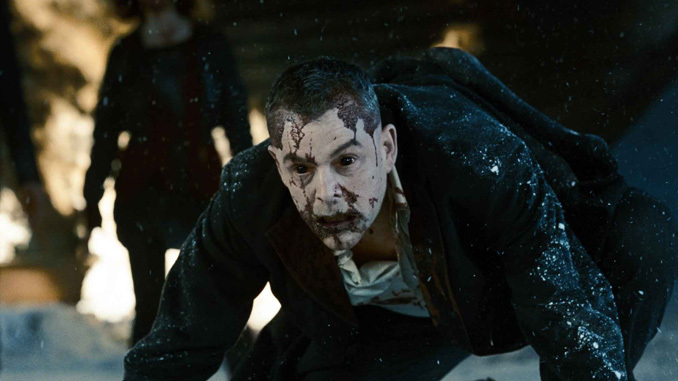 I dismissed 30 Days of Night when it was first released. Teen-heart-throb Josh Hartnett, vampires, no thank you. Boy, was I gravely mistaken. One of the finest vampire movies, 30 Days of Night takes place in an Alaskan town where there are extended periods of darkness, perfect for vampires. The vampires here are not suave, romantic, leading men. They are bloodthirsty, monsters who mean business, and the results are a lot of fun. 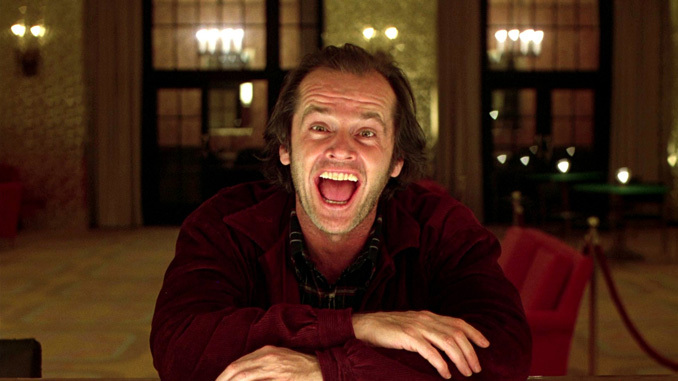 Considered one of the greatest horror movies of all time, The Shining has given Stanley Kubrick and Jack Nicholson one of their most iconic movies. A mysterious hotel causes a man to go mad and try to kill his family during a snowstorm. 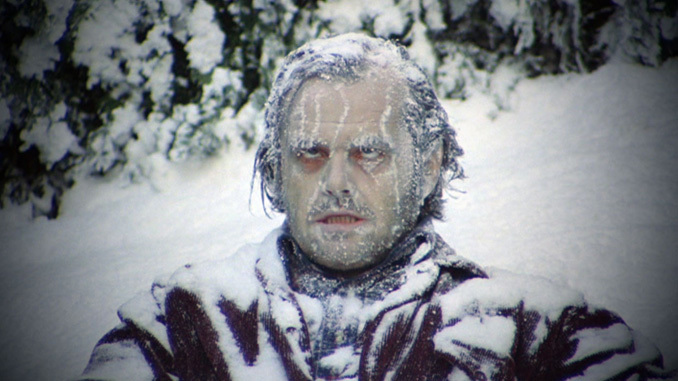 Beautifully shot, and incredibly acted, the audience believes that Jack Torrance is going insane. The only salvation is his son with psychic abilities. Stephen King sure knows how to take something comforting, like a family, and turn it into something sinister. A cold snowy night is a perfect setting to sit around the warmth of a fire to get a person in the mood for Christmas. 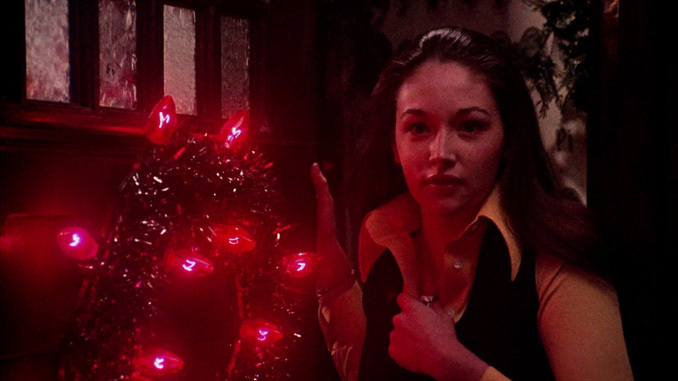 The season is filled with love, but 1974’s Black Christmas has no time for that. One of the first slasher movies is also one of the best horror Christmas movies out there. A sorority house terrorized by a serial killer. Full of suspense and murder, Black Christmas is a perfect way to spread holiday cheer. 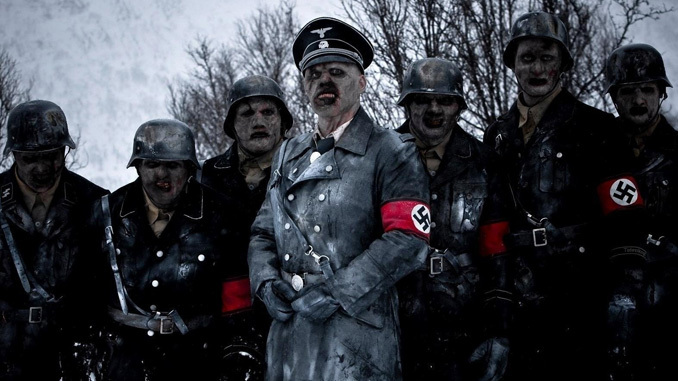 Nazi zombies, that’s all you need to know about Dead Snow. A group of friends head to the mountains for a relaxing weekend, but soon must fight some Nazis that have risen from the dead. Part horror, part comedy; Dead Snow is fun no matter how you look at it. It’s one of those movies that you won’t really believe was made until you watch it, and then you’re not sure how you went so long without it. It’s nice to be able to forget about the terrible snow and turn off your precious brain for a while. It’s not often that there is a blend of horror and romance, but 2008’s Let the Right One In somehow manages that difficult feat. A boy who has been bullied falls in love with a young girl who helps him get revenge. The only problem is she’s a vampire. 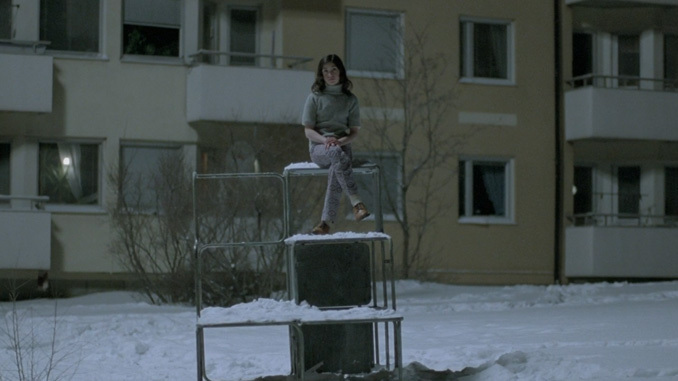 Unlike another famous vampire love story, Let the Right One In is mature and intelligent. While it is a love story, it stays a horror movie throughout, and that is an incredible accomplishment. 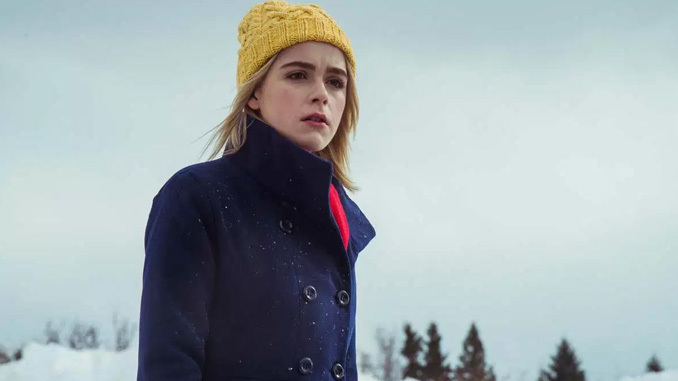 One of the newer films on the list, The Blackcoat’s Daughter follows two girls alone in a boarding school over winter break. It’s a true slow burn that reveals itself little by little until the dark secret is revealed at the end. The horror doesn’t come from a jump scare or from grotesque images, but from an unsettling place that leaves you unnerved. In the end, everything ties together in a satisfying way. 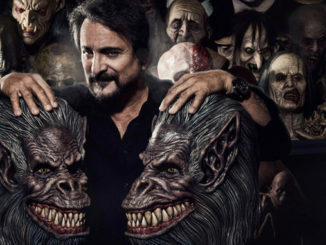 The horror in Misery does not come from a demon, alien, or monster, but in the form of an obsessed fan. 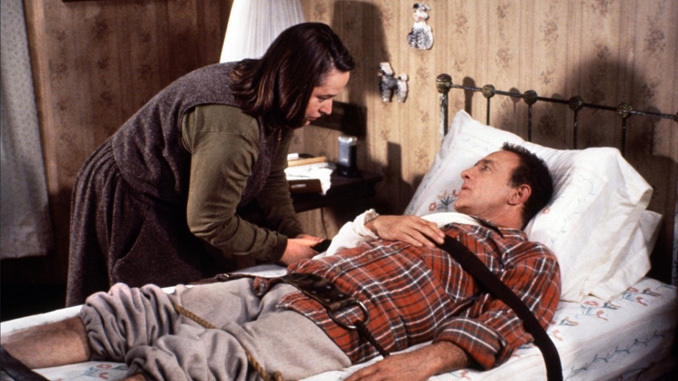 Stephen King’s story, director Rob Reiner, and stars Kathy Bates and James Caan accomplish what seems to be impossible. They pull an endless amount of horror and tension out of a small premise, a famous author is rescued from a car crash in a snowstorm by a deranged fan, without getting gory or over the top….unless you count the hobbling.